Modified bitumen roofing is an asphalt-based solution designed for buildings with low slope or flat roof structures. It can be installed by heat-welding, hot-asphalt, and cold-process adhesives and is considered one of the most popular roofing systems. If you need a commercial roof replacement, modified bitumen is a high-performance solution that offers ease of application and long term efficiency. Although there are layers involved in mod-bit roofing because of the recommended underlayment, it is considered a singly-ply, not a built-up roofing system. APP (Atactic Polypropylene) – Applied using a heat-welded method, the top surface comes in either smooth or granular. The consistency and uniformity of the factory produced sheet results in a membrane that has greater stability and flexibility than that of a laminated built-up roof system. SBS (Butadiene Styrene) – Usually applied using hot asphalt, bonding adhesives, heat welding or heat activated self-adhesives, the top surface is a mineral granular of choice of colors. It has the benefits of a built-up redundant system with the quality of a factory single ply membrane. It’s waterproof – Several layers of bitumen on a properly-installed roof makes modified bitumen roofs the most waterproof commercial roofing choice available. It’s efficient – It’s easy to turn a modified bitumen roof into an energy efficient “cool roof” simply by treating the top layer with features such as solar reflectance and thermal emission. It’s flexible – Low-slope and flat roofing materials have to be flexible for impact resistance and temperature fluctuations. Modified bitumen expands and contracts without losing its shape. 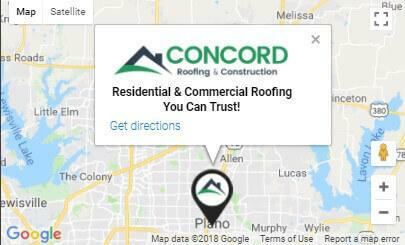 At Concord Roofing & Construction, we have extensive experience providing quality commercial roof installations to satisfy all your roof repair and replacement needs. All roofing systems we install are guaranteed by the manufacturer for material performance and we are in compliance with strict installation standards..
Concord Roofing & Construction is your roofer of choice for commercial roof replacement services. We understand the complexities of providing the absolute best in commercial roofing installations, while ensuring minimal impact on your daily operations. We are a GAF Master Elite Certified contractor and have reached the top certification from the oldest and most established manufacturers in the world. We offer a wide range of commercial roofing services for business owners, churches, multi-family apartment owners, property management firms, and general contractors. Call us today to schedule an appointment at 214-978-6423. Our Commercial Roof Experts are available 24/7.